Our colleges are our homes. Colleges are shaped by the efforts and successes of students. They are shared communities created by students and staff: our ownership of our college experience is what makes Durham unique. So with a 17th college in the process of being built, we assumed that the Durham way of doing this would be a community effort. 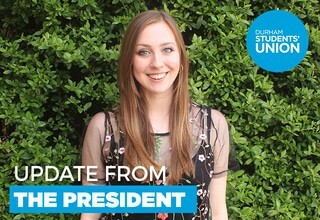 Last term a policy was passed by Durham SU’s Assembly suggesting how students would like the new college to be named. This represented a unique opportunity for us. How great would it be for Durham’s 17th college to be named after a woman of the North East or a pioneering person of colour? It also gave the student body some ownership of an element of a masterplan which we weren’t part of creating, and feel somewhat alienated from. But University Council has not been supportive of our input. Initially, the name for the new college was to be voted on in a Town Hall meeting, where staff and students could have their say and vote on a name. Since then, University Council has recognised the opportunity to raise money by naming the college after a donor and is refraining from specifically naming the college before one is found. This means we have gone from having student and academic co-creation, to the decision being completely taken away from us, despite the Vice-Chancellor coming out publically to say that this would be a collaborative effort. Realistically, this decision means the college will not be named with any thought for increasing diversity of the people we choose to honour as a community, something clearly lacking when you realise 13 out of the 16 colleges are named after men. It’s also one thing to name a learning building after a donor, but naming students’ homes is something else, and something that I fundamentally oppose shutting students out of, especially in a University supposed to pride itself on being committed to a culture of student consultation. I find it embarrassing that our 16 colleges, named after people who have achieved great things, or are renowned in history, could be followed by colleges simply named after someone who is willing to cough up enough cash. So many of our colleges are in need of refurbishment, what if donations are only supplied to colleges if the college takes the donor’s name? Would the University go so far as to rename Hild Bede if someone offers to pay for the extensive refurbishment necessary there? Does this set a precedent for all colleges in future? Durham students now come together to say that we won’t permit our community to go to the highest bidder. Join the Durham SU petition to draw a line for the sake of our community.